Please refer to our stock # vrba20LIX when inquiring. Regal and dramatic, this Lawrence Vrba set is elegant. 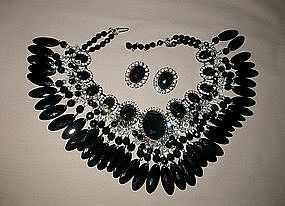 Faceted round crystals and black beads, long oval faceted beads and tiny rhinestones compose the dangles on the fringe, while convex faceted black beads and rhinestones compose the necklace itself. The necklace is 19" end to end, including a 3" extension, and the front of the necklace is 4 1/2" from the top to the bottom of the fringe. Lawrence Vrba oval name plate is on the back of the necklace. The matching oval clip earrings are 1 1/2" by 1 1/8".